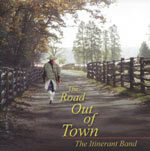 To hear sample selections and purchase CDs, click on the album cover. 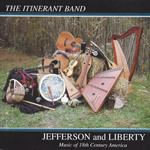 Jefferson and Liberty is a collection of 18th century tunes and songs chosen as representative of those played and sung by working class musicians in the North American colonies. �It features jigs, hornpipes, and reels from the English and American country dance repertoire, as well as a French-Canadian dance and party song. The Road Out of Town is our second collection. �The music ranges from the 18th into the early 19th century and features several examples of tunes and songs that traveled from old countries to new. 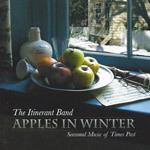 Apples in Winter Apples in Winter is a compilation of music from various times and cultures in a celebration of traditions of Christmas and the Winter season. Some selections will be recognized as what we think of as Christmas music, while others are traditional tunes with a winter theme. 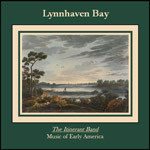 Lynnhaven Bay is our fourth recording and features music from several projects over the past five years.� We included music from the 17th and 18th centuries, as well as some material from the 1812 period. Untaming the Shrew Tangent is Marsha Wallace, Dreda McCreary and Connie Smith. Why Tangent? Because they are constantly off on one. They wander from traditional songs of the British Isles to original material to contemporary tunes and songs, and back to traditional American music. Comfort and Joy was recorded by Bob Clark and Beverly Taylor, using piano, guitar, recorder and two hammered dulcimers to create an instrumental collection of favorite Christmas music.